Cabbage – everyone's favorite healthy vegetables, what other culture can compare with her vitamin C. It is great for salads, soups and canning. To get a good crop of this wonderful culture on your site, you need to provide her with meticulous care. Especially this culture responds to feeding. To make the soil more suitable for this vegetable, we still have the autumn to make her manure, as this plant loves organic fertilizer is the perfect food for the cabbage. In acidic soils under perekopku you can add lime or ash, because they lower the acidity of the soil. If in the autumn the land for planting was not prepared, then you need to do this in the spring when preparing the beds. For this purpose, perfect compost, and a small amount must be paid even if the land was fertilized with manure in the fall. The compost should be lightly covered with earth. In addition, it is desirable for the bed to throw potash and phosphate fertilizers. The best time to do this can be considered a week before transplanting to a permanent place. In addition, you can add nitrogen fertilizer because they are needed at an early stage of plant development. For early cabbage varieties only three feedings per season, late have to fertilize four times. Early maturing vegetable fed every three weeks, and late maturing – at least, the most recent procedure should be made no later than the end of August. Early in the season is good to fertilize cabbage fermented infusion of grass or manure, also for this perfect chicken manure. In the last stages of the growing season you should be very careful to apply nitrogen fertilizer. The reason for this is that nitrogen promotes accumulation in vegetables of nitrates, therefore, the closer the date of harvest, the less nitrogen it is possible to make a culture. 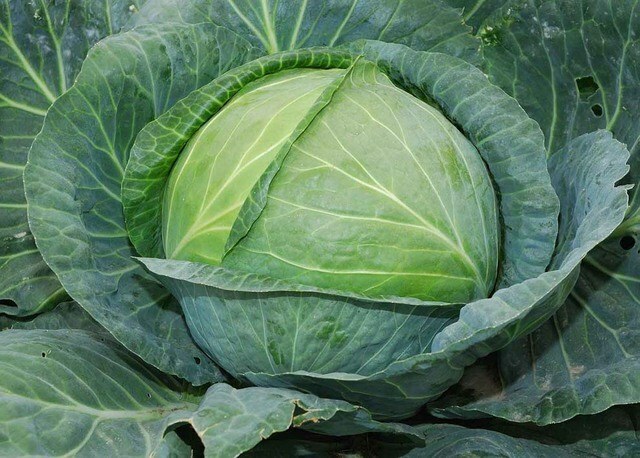 Finish feeding cabbage double dose of phosphorus and potassium, while the nitrogen content should be reduced by half. Also, in addition to the accumulation of harmful substances, the fermented infusion of herbs and manure, used for fertilizing in the late stages, can cause the cracking of heads. Such vegetables can not long be kept. Over abundance of phosphorus in the soil need to be monitored throughout the season. With its lack of the tips of the leaves begin to wither, and the leaves appear bubbles. When potassium deficiency on leaf plates appear brown bubbles. In the early stages the lack of nitrogen manifests as pale leaves and slow plant development. The lack of feeding during this period can lead to drying of cabbage. Subject to the rules of any dressing you can get an excellent crop of cabbage. The main fertilizers are manure, potassium and phosphorus – use they need, given the stage of crop growth.